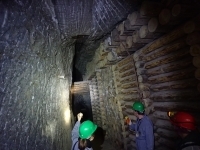 Damian Skrzelowski organised another superb trip to Poland to visit two salt mines, a natural cave and a coal mine. He arranged the accommodation and transport in advance that enabled nine of us (well, eight most of the time, but that’s another story) to stay and travel together. Ed, Phil E and John C travelled from Manchester while Damian, Phil L, Terry, Nigel, Jodie and Jakob travelled from Doncaster/Sheffield airport. 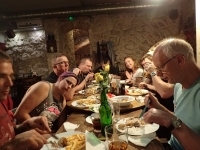 By the early hours of the first morning, we were all together in Krakow, the Doncaster crew having successfully woken the Manchester crew at about 2am on arrival. 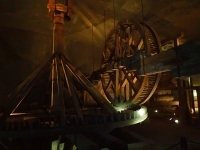 The first day was a visit to the salt mine at Wieliczka. 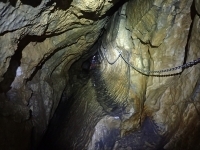 The trip arranged was the miners’ route down into the mainly non-tourist area. We were provided with overalls, helmets, lights and CO self-rescuers in case of fire. 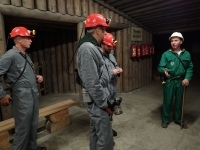 Our leader spoke good English and was very patient with the photographers as we went round the mine. 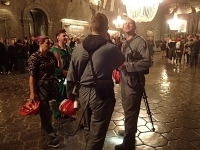 The descent started down the Regis Shaft for 57m and we then travelled underground around the area between there and the main tourist shaft (Danilowicz Shaft) before ending in the restaurant 135m underground. 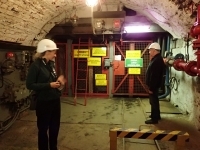 Afterwards, we saw a bit more of the tourist area before returning to surface up the Regis Shaft from -101m. The whole trip lasted about four hours. Above ground, we had a look at the “Graduation Tower” and a steam loco parked up on a siding (you get in the cab through the roof). 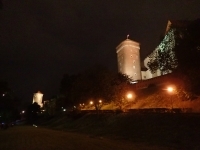 That evening, we went to visit a 19th century fort on the outskirts of Krakow. Later, we ate in town but missed the concert in the main square! 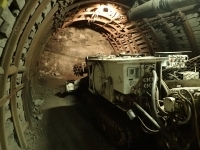 Another day – another salt mine. Sadly, we lost Jakob for the next few days as a result of slight over-indulgence on Saturday night (lamp shades have more than one use). 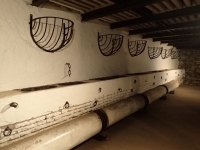 After dropping him at Damian’s cousin’s house, we went on to Bochnia salt mine. 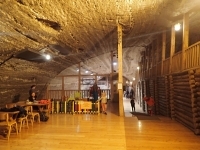 This was a different experience as it is less busy than Wieliczka but again we had a trip into the tourist areas. Again, we had boiler suits, lamps, helmets and even gloves and we had to sit through a Polish language video on how to use the CO self-rescuers. Three signatures later, we descended the Campa Shaft with our miner-leader and a geologist interpreter on her second trip with tourists. 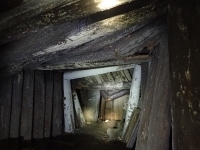 The trip was no less interesting than the day before and we got a better appreciation of the working areas of the old mine. To start with there was a trip on the mine train. 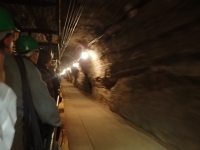 We seemed to be going up and down including a descent of the Sutoris Shaft from the second level to the fourth level. Eventually, we arrived in the main tourist area with restaurant, games room and of course the slide. Finally, we returned up from the fourth to day. 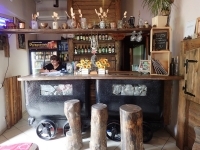 A visit was made to a restaurant in town before we headed off to Zakopane. 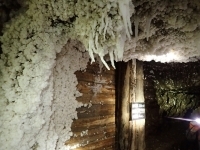 Anyone interested in the geology of the salt deposits in Poland might want to look at the English language article at https://www.pgi.gov.pl/images/stories/przeglad/pg_2008_08_01_17.pdf. 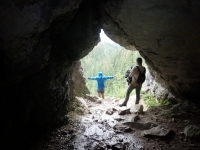 Before eating, we headed off for a bit of Urbex up the hill behind Zakopane. 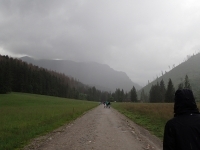 In the end, two went into an old hospital grounds while the rest of us admired the views of the Tatras Mountains. 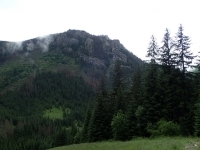 The hostel was a typical four storey building on the outskirts of Zakopane. We ate in Zakopane off wooden platters (can’t they afford plates?) in a restaurant on the main street of the town. The weather was threatening rain again (it had rained every day so far) so the first stop after breakfast was Mountain Warehouse to buy coats and a local souvenir shop for umbrellas! Suitably re-equipped, we headed to the Dolina Koscieliska in the national park. After paying our dues (£1 for adults and 50p for pensioners), we walked about 5km up the valley admiring the views of the mountains and river. The entrance to the cave we were going to visit is well sign-posted – or so we thought. 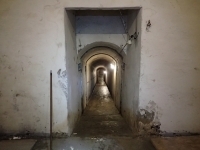 Following a steep path up the hillside, we came to an entrance, prepared and went inside. It was odd to find a low crawl just inside followed by a chamber and another squeeze but we all pushed on despite bruised heads and knees. After a little while and a bit of map work, we realised that it was just possibly the wrong cave! Back to the entrance and a few more metres up the track we came to the right cave, easily identifiable by signs and red/white paint markings. Oh well, we’d better do this one as well as the route is one-way. Inside, there were still low sections but the route was easy to follow. We caught up with another group who seemed to have even less kit than us (one light between two) but were being led by a National Park guide. We let them stay ahead and of course we were soon back out to daylight at the second entrance. There is a good map of the cave with detail on the website: http://www.czarnadziura.net/2016/01/19/jaskinia-mylna-trawers-mylna-raptawicka-oblazkowa/. 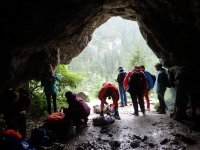 After that exciting trip, we went back to the main path and then took a side path up a gorge and a fixed ladder to another cave, Smocza Jama. This little through trip could be by-passed by a bit of via ferrata. Beyond it, the path took a steady descent back to the main path. Back at the river, Damian decided to cool off in the river. That was enough for us (and the other visitors) so we hastily left the Park before the wardens caught up with us. That evening, we walked from the hostel to a local bar/restaurant for a good meal. 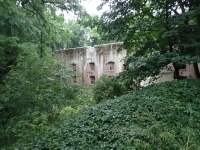 We had a fairly early start and long drive to get to Zabrze and the Guido Coal Mine. However, we were in good time to get on our trip at 1pm and have some refreshment beforehand (having a Lidl next door was useful!). 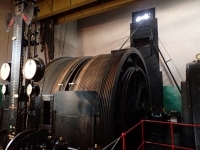 Before we started, we went into the winding house to see the machinery there. 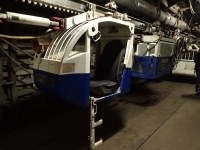 The start to the underground trip was down to the 170m level using the Kolejowy Shaft with its triple-deck cage. 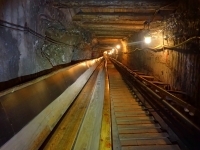 We toured around that level and then dropped down to the 320m level for a further tour including seeing some of the mining equipment in operation. 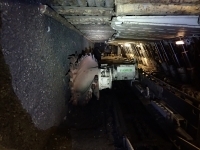 This included conveyors (belt and chain), a road-header and two face cutters. Finally there was a trip on the mono-rail railway and a visit to the pump room and bar! Our leader was a young lady electrician from a nearby working mine who clearly enjoyed operating the machinery, even when the battery in the remote control had run flat. We had half an hour or so in the bar before returning to the surface. All in all it was a very interesting trip, far better than Caphouse Colliery in England. 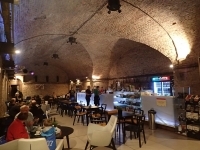 This was the last underground trip so we drove to Oswiecim (Auschwitz) where Phil E, Ed and John were dropped off at the Krakow bus as they were staying the night there and flying back to Manchester the next day. The rest of the party stopped in a guest house in Oswiecim. 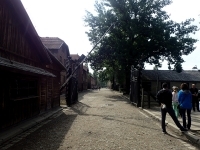 For the final day, Damian and Jodie stayed together and visited Damian’s family while Nigel, Phil L and Terry visited the Auschwitz museum and sites. 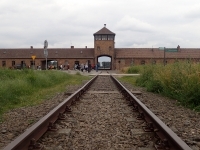 These were interesting but thought-provoking sites consisting of the Auschwitz I concentration camp and Auschwitz-Berkenau extermination and concentration camp. We had a six-hour guided tour with a very good American-Polish guide. Afterwards, we met up with Damian, Jodie and Jakob (who had re-emerged from alcoholic hibernation) and made it to the airport for the return to the UK. It was a great trip and went very well thanks to Damian’s excellent planning. 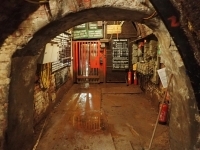 Pity about the weather at times but it did not make a great deal of difference to our underground experiences.